TheTECHNODRIVE power take-offs “BD” mode) may be coupled directly to Diesel engines with SAE flanges.They can be used for a variety of industrial applications where there is a need to disengage movement from the engine to the driven unit, such as the drives of compressore, fans, pumps.The mechanically controlled dry-disc clutch is equipped with a housing and supported by a shaft. TECHNODRIVE range consists of single-disc power take-offs by 6″1/2, 7″1/2, 8″, 10″, 11″1/2, double-disc power take-offs by 11″1/2 e 14″, triple-disc power take-offs by 11″1/2, 14″ e 18″, able to cover a power range between 15 and 700 kw. 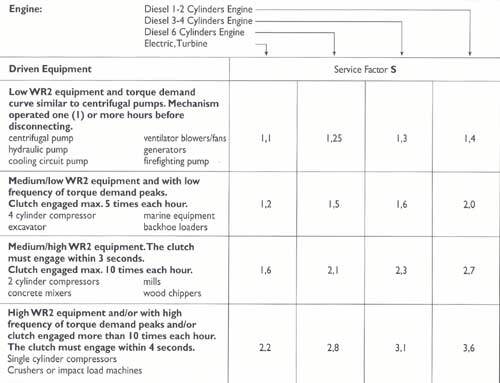 The selection has to be made comparing maximum torque value that may be transmitted by the clutch, indicated with T in the catalogue, and maximum torque value absorbed by the driven unit Ta multiplied by service factor S obtainable from the table. “BDS” clutches are obtained by the corresponding “BD” clutches with the addition of a closing housing and of an input shaft to allow themselves an independent mounting. Radiai loads on input shaft ere not allowed. Single plate and double plate 11″1/2 Pto’s can be supplied with suitable output for direct mounting of hydrostatic pumps. Torque and technical characteristics are same as correspondent “BD” and “BDS” models.